The material was presented in a well organized manner. The updated NCBTMB standards of practice is good to have; my original was dated back to 2003. Thank you for an easy way to acquire the four ethics CEU's required every two years by the North Carolina Board for license renewal. I really enjoyed the course, and appreciated the personal/therapist examples (one of the reasons I like in-class training). Thank you for this course, and it will help me in thinking about new ways to expand my practice. I found many new classes that I want to take at another time. I will definitely be back for more. This course included all aspects of therapeutics, encompassing detailed descriptions and comparisons of each modality. The ethics of therapeutic massage are important and the additional information leads to a greater awareness for referring clients in need. This was more thought provoking than I expected. I appreciate the contemplative exercises encouraging the student to look at personal philosophies and I also appreciated the cases presentations. I also appreciate the respectful approach to alternative therapies. I am curious why such a relatively large amount of attention was paid to pseudoscience. However I did find it thought provoking for examining my own views on energy work and other alternative modalities that I use. I would also like to see transference/counter-transerence examined in a little more detail, but it did get the point across. Like if the client is transferring mother issues, how might that be recognized by the therapist. Thank you for the thoughtful materials. I really enjoyed the "Paradigms of Health and Illness". Thank you for holding my attention by looking at more facets of a common topic! I loved being able to test online. That\'s a nice plus for those of us with a busy schedule. The writer presented the material in a clear and concise manner. I enjoyed the material and retained it nicely. Thank you. The course was clear and straight forward. Received materials in a few days and was very pleased with this home study course. Thank you! Well organized and easy to access. Excellent class. These courses are convenient and cover every aspect of the field/modality! I can always use what I learned in these courses!! Thank you! Great course a lot of good information. This is a wonderful course. Heather who is an employee for this company is an asset to your TEAM. Completing this course was my first experience with IIHS. The course materials were very well organized and clearly written; the content was current and highly relevant; the course fee was reasonable; and the test questions were easy to understand. I will definitely seek future courses from IIHS. Thanks for such a positive experience! Excellent ethics review for healthcare professionals! This was a fabulous course. Very well presented. I'm keeping this one in a notebook for future reference. I've taken many courses from the Institute and find them all highly informative, challenging, and pertinent to my work as a Licensed Massage Therapist. This Ethics course enhanced my grasp of ethics and opened my eyes to various issues I've encountered over my 35 years in practice. I especially appreciate the course delving into all the therapeutic approaches in both 'standard' medicine and the holistic modalities. I really liked the tone of the instructor. It was not a dry lesson but interesting and thought provoking. She did not steer the subject matter with any bias and I really appreciated that. The points made were with clarity, logic and relevance. Awesome job and thanks for the education! An excellent course! Lots of important information for all massage therapists. I really appreciated the "Paradigms of Health and Illness" section in the text. The "Therapeutic Process" section was excellent. Thanks for including all the examples and questions we should consider as health professionals. 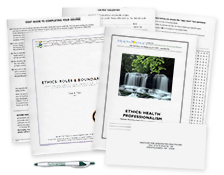 The best ethics course I have taken in my career as a massage therapist. This course provided an excellent overview of the ethical issues facing Massage Therapists. I found the suggestions regarding how a person may conduct their intake of clients and maintenance of client records in order to become better practitioners and avoid ethical problems to be very helpful and practical. Thank you for the course. It was easy to complete and presented some thought provoking questions and examples. I was grateful for the review on many topics and appreciated the detailed glossary of terms. I will use your courses again. Thank you. I am grateful for the courses you provide and the ease in which I can complete them. Again, thank you. It seems the course has been updated since the last time I took it and has new relevant information for massage therapists. Thank you. I have already taken ethics. Not sure why we need to take every time, it’s the same as always, however, your course was good! I learned how to differentiate, in a reliable manner, the difference between bio-medical, holistic, and OM. Very good course, even after 10 years as a massage therapist. Very easy to follow content and test, thank you! I thought this course was a good refresher course and very useful. I so enjoyed this course and the reference to history on the different health care approaches. Thank You. This course was a great reminder of my original ethics class I took when I was in school. There were also sections that had information that I hadn't studied before. All in all this was a very informative course that was easily understood and very straight forward. Thanks! This course certainly met my personal expectations. Thank you. This was an exceptional course that covered a wide variety of ethical considerations! I highly recommend it for practicing therapists. The course took a lot of attention to details needed in a MT practice!! Very impressed! This is a well designed course that contains the essential information that all practitioners should know. Very well done! This class was more informative and interesting than any other Ethics classes I have taken. Ethics is my least favorite, required, continuing education. It is my least favorite because it is usually all repetitive and boring. There were things in this course that were new to me and kept me engaged. Thanks! This specific course definitely refreshed my memory on some laws and ethics...as well as provided new information on the different forms of medicine! An excellent overview of ethical professionalism; providing clear directions on therapist-client boundaries. This was exactly what I needed! The information was clear and concise, easily accessible, and very thorough! I will absolutely be using the Institute's courses again! experience, and reinforce my professional goals. Great and to the point. No unnecessary “filler” material. Also very educational. After 29 years as a massage therapist I have taken mandatory ethics classes and this was by far the best and most concise. The course was interesting and informative. I learned things that will help me in my business. Good refresher course and was able to pick up a couple of things i might have missed while in school. Thanks! This was very nice to do at home and take my time reading what interested me most, catching up on history i had forgotten about, years ago! This course was informative and will be excellent reference material in the future. Also concise and well organized. I just got through teaching this course, but needed to take it to fulfill my state requirements. It was well organized and easy to understand. Much appreciated. Thank you for bringing back what is truly important to being a professional. Excellent course. Being an RN BSN as well as a MT, I found the course held my interest and stimulated my thoughts regarding the MT profession. This was the first experience I had taking an online course. It was very organized and easy for me to follow. I really enjoyed the part about boundaries and the Client and Practitioner Bill of Rights. I find it challenging in my practice not to bend the rules for people. I think this class will allow me to shift my mentality. Enjoyed the content of the subject and test. Retained the information and will be back to do more of the classes. Thank you! This was great - concise yet thorough. I really appreciated the online format! Easy and straight forward, that being said, the information presented held great value which should be a key base in any professional business. Great refresher on key elements on the ethics of running a small massage business. Awesome course because you can do it all on your own time schedule. Excellent content and easy to understand. Very good layout. It helped put things into perspective and gave some good case studies as reference to how important ethics are in everyday situations. Excellent; easy to read; liked having the hard copy questions available. Great Course. I use the manual for information as reference when needed. Thank you. The course was very excellent I would recommend it to others!! This course was succint and to the point. Four hours of ethics is a necessity for me to renew my massage license and this was the perfect course to take at home. Thank you for providing this to a working mom who can't take the time to go to workshops away from home. Thank you for this course; it is convenient for me being so busy these days to complete my requirements on time. This course helped refresh items I had previously learned as well as giving me new tools to use in my practice. I thought this course was very informative and well done. I was able to refresh the information I need and obtain the credits to maintain my certification. Thanks! This was a very good course. I'm glad I decided to use it. The material was understandable and it was easy to find answers. It was affordable and well worth the price. Well presented and well covered with clear examples pertinent to the subject. Such a great refresher and really reaffirmed the importance of SOAP notes and documentation, as well as breaking down the details of a referral. Very straight forward to the point and applicable. Really good course. Very easy to navigated and do in the comfort of my home! Enjoyed this course very much and looking forward to another one. I found this course interesting. Including ethics into it was an added benefit. Very informative with a easy to follow layout! Thanks! Great course, learned some new ethical definitions and quickly fulfilled my state licensing requirements for ethics. Informative and interesting. I have a better appreciation of my ethical and professional obligations. Very helpful, good pace, layout and content. Liked it! Text was easy to read and kept my attention. I was able to retain the information read with ease. This is a good refresher course on ethics, and the way it was presented made it interesting. This was well written and informative. Exceptional ease when purchasing, downloading materials, and during the actual test taking process. Very satisfied with product and price! Really great and thorough course. The information is relevant to my profession and can be applied accordingly. I thoroughly enjoyed this ethics course. The presentation was great and the content provided valuable information. Great course! Very helpful and informative. Kept my attention. I appreciate the class and course materials are straight to the point and easy to understand. Very user friendly, and content is valuable and refreshing. As a necessary requirement I found this course fairly painless and actually very informative, well laid out, and easy to navigate. Thank you. I was happy that it was so straightforward. I loved it. Wasn't overpowering...interesting. It was a good course, I gained new info I can use in my practice especially in accepting and giving medical referals and working with other health professionals. I felt it was very well written. Very informative and interesting content. Would recommend to others. I was pleased with the information I received in this course. I definitely learned some knowledge...it was a great way to refresh my memory regarding ethics. Great classes! I am spreading the word! Such a great affordable option to get some Required CEU's in!! Will be back for sure!!! Course was a good review, even after practicing for 10+ years. Great refresher course with very valuable insights and usable information. Thank you for preparing this course so well and for not making silly trick questions as I found on my massage boards several years ago. This was a very great ethics course! Especially being online. The personal stories, I felt, help me wrap my mind around how severe it can be if you don't chart properly. Information was presented well and flowed nicely. I was glad I found this Institute. The course objectives, what was expected of me, what I needed to do, and what I learned from the Institute were great and understandable. I would recommend this Institute for others if they are truely interested in learning other than just getting the credits they need for continuing education classes. Great learning experience. It's a good way to review my Ethics. Any massage therapist should take this course. It pertains to all our practices and gives great legal, moral, and ethical advice. I definitely learned a lot of useful information. The courses content and test were clear. It was a great time/money-saver to access this online. I will recommend this course to my classmates. Thank you for opening my eyes to things that I was not aware of before I took this class...good and useful information I can can keep in mind as I begin my business. This program was easy to use. I found this Ethics course approached ethics from a different view, I enjoyed the course. Thank you for providing clear, effective and efficient information at a very much appreciated economical price. Honestly, ethics courses are my least favorite to take. This course was actually fairly interesting and I learned a few things which I am grateful for. Thank you! This course was amazing! It really gave me some great information to not only use in my own practice, but to also share with my peers as well. Thanks! Really wonderfully written and informative! This was a great use of my time and money! This course embraces history, art, science and ethics, using simple yet powerful words and examples. What could have been boring and dry reading was interesting and refreshing! I learned so much more than I expected I would. The information is very valuable in my practice. I will keep this book for future reference and also use the information to improve our practice. I will share the information with other therapists in our office. I also highly recommend this course to others. The course was/is designed in an easy to read and follow format. Excellent information for anyone working in the health care field. I am keeping my booklet for reference. A lot of good and very useful information. I especially liked the assessment section. This program and study guide is to the point, factual and informative, easy to use. Great ethics material! Loaded with useful information. This course helped me to complete my requirements while working within my schedule. Very well organized content, well explained, comprehensive and well related to the course subject matter. course very informative and easy to take. The course is easy to take anywhere you go. This course was very detailed and insightful. This was my first home study course. It was written well and all information was meaningful to my practice. I will definitely refer to others. The course was very informative and will continue to be used as a reference, particularly in the area of client records. Amongst the myriad of CE courses to choose from - glad to have chosen this one. I liked how the course was broken up into different categories, that really helped the time fly by. 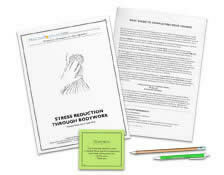 An excellent course to refresh the mind and hone the skills - I am a nurse as well as a massage therapist with a masters in counseling psychology. Good course. Lots of interesting information. Very informative & refreshing. 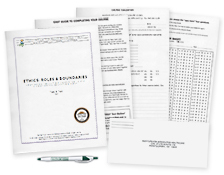 The boundaries help to bring business practices to light & assured me I've been practicing properly. This is a very informative ethics course. It refreshes things that can be easily forgotten. It helps to remind all of us how important ethics and professionalism is to our clients as well as to us as therapists. The course was easy, practical, and refreshed my boundary practices for the safety of myself and client. Thank you! Found this course to be thorough and thought provoking. Very relevant to my practice. Excellent material. Good refresher course. Pleasant and interesting reading. Test questions fairly reflected course material. Thank you!